As an animal care technician at Indianapolis Animal Care and Control, Nancy Mynatt has made a big difference in the lives of countless canines. But two years ago, when she learned about the Youth-Canine program from fellow employee Jodi VanSlyke, she saw an opportunity to not only improve the lives of dogs, but the lives of youth as well. 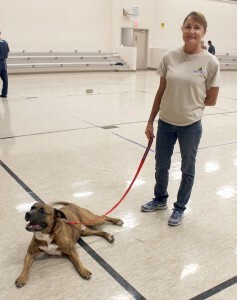 Since then, Nancy has served as a dog handler in the program, helping academically and behaviorally challenged students learn how to train shelter dogs in need. With Nancy’s guidance, the youth teach the dogs basic obedience skills, including sit, stay, look, and leave it. Both trainee and trainer are on a journey of learning and growth during the course of the Youth-Canine program. Nancy has witnessed firsthand how the improved focus, confidence, and self-esteem of the dogs is contagious to the students. “My favorite part of volunteering in the program is when the kids get excited about the progress the dogs are making. It’s something positive that makes them smile”. 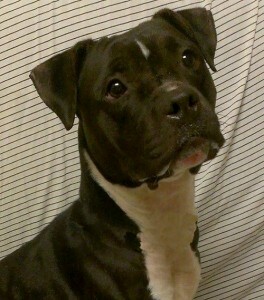 Liza is grateful to Paws & Think for helping her get a second chance after ending up in a shelter. Help put more dogs like Liza to work helping people. Donate to Paws & Think to make an impact today! Liza’s journey began in a rough spot. Like many in her breed, the pit bull mix ended up at IACC — despite her sweet disposition and intelligent nature. After spending six long months in the facility, Liza was selected to participate in the Paws & Think Youth-Canine Program. After passing a temperament test, Liza earned the chance to participate in the program with four other dogs. Throughout the week, teens at the JDC learned valuable positive-reinforcement training techniques and taught the dogs basic obedience skills. The program, designed to empower residents at the JDC through the power of the human-animal bond, also benefits the dogs. It gave Liza and her companions the chance to learn basic commands, become more adoptable, and take a much-needed break from stressful shelter life. Wendy Hendricks, a long-time volunteer of the program, heard about Liza through a friend in the program. Word traveled that Liza loved her trainers and would let the boys hold her like a baby. “Liza learned all her basic obedience skills, and the boys even taught her to roll over,” Wendy says. Once Liza returned to IACC, Wendy visited her, spent hours getting showered in love by the sweet, goofy pit bull, and introduced Liza to Duke, her 11-year-old bulldog-pit mix. The adoption was approved that same day. Liza was a perfect fit for Wendy. She quickly became a bossy younger sister to Duke and has never met a stranger. “It didn’t take her long to discover the couch and bed,” Wendy laughs. “She is my Velcro dog at home — always wants to be where I am.” Wendy continued Liza’s training in a basic obedience class. Once Liza fully settled into her new life, Wendy enrolled her in the Paws & Think therapy dog certification program. Liza passed with flying colors. This initial hesitation, Wendy explains, sparks a dialog about the breed, and Liza’s personality opens the minds and hearts of everyone she meets. She shared that nurses often comment on how some patients aren’t verbally or physically engaged with anyone, and how wonderful it is that Liza can get a reaction from these patients. Per her mom, Miss Liza Jane has certainly become an ambassador for her breed, and for rescue dogs in general. She is now improving the lives of many patients.